Núcleo Estrela Matutina. (Brasília – DF) | Photo: Isaac Amorim. “For the purposes of mental concentration, the associates, of their free and spontaneous will, drink a tea, Hoasca, which is the union of two plants, the Mariri and the Chacrona, proven harmless to the health”. (Excerpt from the Bylaws of the UDV, from 1971). This claim made by the União do Vegetal continues to be confirmed by scientific studies conducted by renowned entities and by decisions of Brazilian and North American authorities. As it is harmless to the health, the use of Hoasca Tea for religious purposes has been fully liberated and recognized by the Brazilian authorities since 1987. In 2006, the Supreme Court of the United States, in a historic and unanimous decision, liberated the religious use of Hoasca Tea in that country, opening a path that was then followed by authorities of other countries. 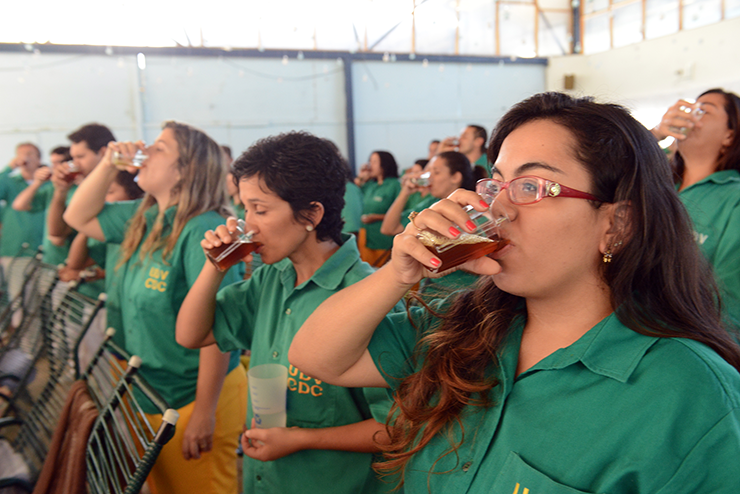 The use of Hoasca Tea as a religious sacrament always called the attention of Brazilian society. In consideration of those concerns and questions, and with the certainty that the Vegetal does not cause harm to the health, the leaders of the Beneficent Spiritist Center União do Vegetal have and continue to position themselves in favor of cooperating and encouraging scientific studies that propose to study the tea’s effects, proving that it is harmless to the health. In 1977, in response to an article published in the Alto Madeira Newspaper (Porto Velho-RO), the leadership of the Beneficent Spiritist Center União do Vegetal published an “Invitation to the Scientific Community” in the Guaporé Newspaper, opening the doors for studies to be conducted. Two studies, conducted by internationally renowned scientists, prove that the ritual use of the Hoasca Tea does not cause any damage or harm to human health. In 1996, almost 10 years after the UDV invited the scientific community to study the use of the Tea, the results of the Hoasca Project were released. This biomedical study proved that Hoasca Tea is not toxic or damaging to the human body and does not cause neurological, cognitive or personality dysfunction. In 2004, the results of another study were released: Hoasca in Adolescence. The study identified among UDV adolescents a strong tendency towards family values, including participation in domestic life and family relations without tension. For the União do Vegetal, yet another proof that the Hoasca Tea is harmless to the health is the observation of its effects in the health and lives of its members. The social statistics of the Institution are clear: throughout 54 years and currently, approximately 18,500 members that drink the Tea regularly (on average two times a month), there are no records of illnesses due to the use of the Tea, not even in the long term. In contrast, among the thousands of disciples with diverse profiles and ages, there are members who are over 80 years old that have been drinking Vegetal regularly since the 1960s and can attest to its benefits.